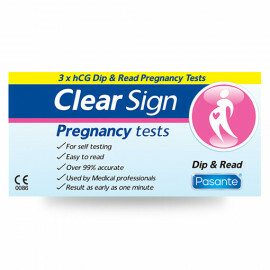 Pepino Dipstrip pregnancy tests are accurate during the early stages of pregnancy and easy to read, making them perfectly suitable for home use. Pepino Midstream pregnancy tests are accurate during the early stages of pregnancy and easy to read, making them perfectly suitable for home use. Pepino Cassette pregnancy tests are accurate during the early stages of pregnancy and easy to read, making them perfectly suitable for home use. Intimed Pregnancy hCG MidStream Test can detect the pregnancy hormone as early as 6 days sooner than the day of your missed period (5 days before day of expected period). The amount of pregnancy hormone increases as pregnancy progresses.